Mud covering my rubber boots, eyes red from smoke of the wood cook fires, exhausted and dirty I sat down on the makeshift table/bench and began sorting out the rice that had slipped through the huller unshelled. I had gone along to Kitaski (several villages upriver from KrinKrin) where we were hosting a large meeting with church leaders from along the river (the churches that asked us to take them under the ministry’s wing after their own leaders abandoned them). Chris and Marcos had picked up 70 plus people the day before and brought them there by boat, and I had come along to help cook. “What is your name,” I asked the young lady who had stopped by the temporary kitchen to help out for a minute. “Velma” she replied and began helping me sort the rice for the evening meal. For a while Velma and I sat in silence our fingers busy sifting through the thirty pounds of rice while the other ladies chattered away about dishes and clothing. “Our village was really fortunate that the Americans agreed to take the lead of this little church, because the things in that tub were all things we use every day,” added Velma, obviously thinking we gave the love tubs to the village of Kitaski because we oversee a church there. “No,” Perla stated stopping what she was doing, “when they gave us the love tubs they still hadn’t even been heading up this church. Just think about it, Mali and I aren’t members of their church; we’re Moravian but we all got tubs! Remember, before they handed the tubs out to us they said that it was a gift of God’s love, and that God’s love isn’t bound under different denominations.” “That is so true” added Velma solemnly letting the thought soak in for a minute. All the ladies nodded their head in agreement then went on exclaiming amongst themselves about the different items that were packed in the love tub and how they still use them daily. I smiled to myself happy to know that they still used the things given them two years before, but mostly because the message had come through that this was more than just a handout, it was a gift of God’s love toward them. With a welfare mindset being very dominate among the people here I sometimes struggle with giving out the love tubs, afraid that they will just take it for granted and further this mindset. Yet when I am able to here that the message really did come through clearly it makes me very excited about doing it again. As the time approaches and we are starting to order things to pack into these love tubs I am so grateful for each of you that have given to pack a tub full of necessity items for a Miskito family. I pray that you will be blessed for your contribution! Chris and Marcos continue to make lots of trips up and down the river visiting local churches and dealing with constant issues that arise. 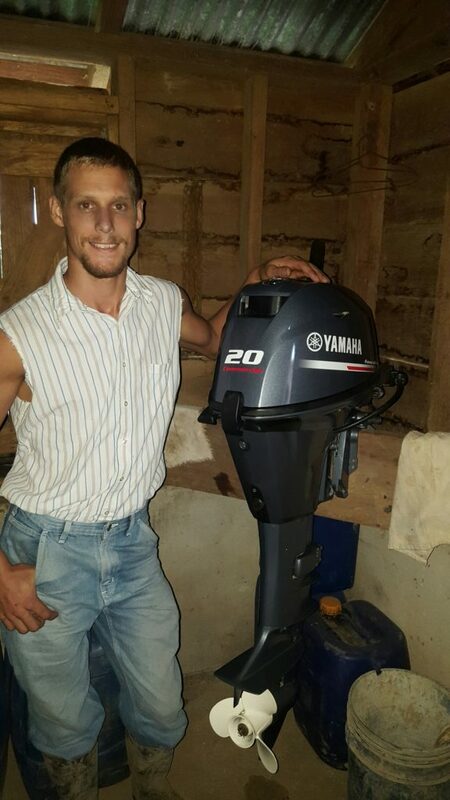 The new small 20HP motor has hardly gotten a break since the day we got it; it is such a huge blessing! Continue to keep Marcos and Chris in your prayers as their work is no easy one. The weather here is beginning to feel a lot like Christmas, breezy and less rain, even cooling down to 70֯ degrees some evenings sending us on a search for our sweaters and blankets. Christmas songs can be heard ringing across the property throughout the day and anticipation rises as the days are counted down till the rest of the family joins us here for the Holiday. It’s a beautiful Saturday forenoon; from my window where I sit at my desk I can look out across the village, cows and horses grazing, ladies preparing to cook the noon meal on their wood fire boxes, little boys walking on homemade stilts, and little girls running down to the wet-weather creek to fetch water for their mother to scrub their house. The month of constant October rains has left the village one muddy mess and we expectantly await the November winds to maybe dry the land out just a little, (and maybe, just maybe a little less rain and a little more sun) along with cooler evenings. 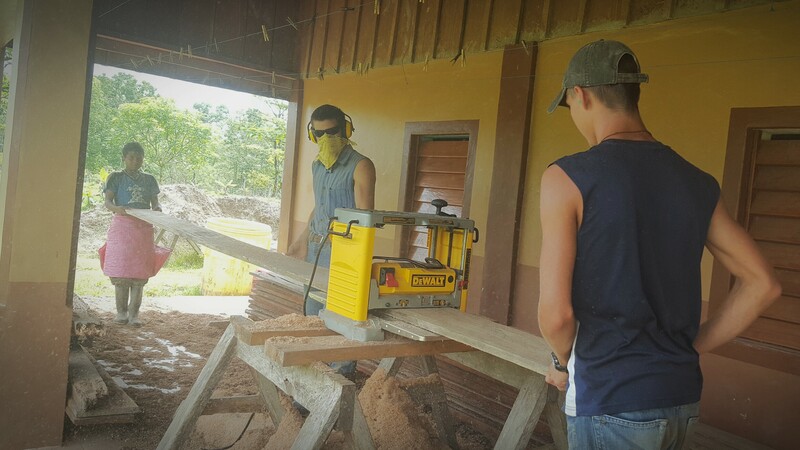 A breeze has picked up and blows through my window across my face; outside on the porch the sound of the noisy wood planer wines as rough cut lumber is fed through the blades; the boys are working on making foldable benches for Bible classes and other group events that we host. These will be super helpful as before we have always just set up makeshift benches, stacking lumber on top of cement bags or whatever we could find that worked. We hope to be hosting another intensive discipleship course at the end of November for the people of KrinKrin as well as a few pastors and church leaders from other villages that have asked if they could attend. We will also be hosting a large meeting next week with the little churches scattered along the river that have asked us to take them under the ministries wing. I know many of you are wondering how our safety is in Nicaragua. I was all over Managua yesterday and today, and things are pretty much back to normal now by what I can see. The political unrest has definitely taken a toll, and it’s been heartbreaking to see all the chaos and destruction. But where we are out along the river everything is pretty normal. The uprising was about people trying to overthrow their president, a lot like the riots in some of the cities in the states 4 to 6 month ago. There has been a lot of violence and killing but again, there has been no direct danger to our family in KrinKrin. One of questions I seem to get asked the most is, “What does a normal day look for you?” This is honestly a really hard question for me to answer because no one day is like any other. I don’t get up every morning and go to a routine job, and I don’t go out in the village every day and preach the gospel either. I am a person who likes schedules and organization so this can be challenging at times; but, I’m also a person who likes adventure, so it is exciting some days having no idea what the next will look like. This lifestyle has become normal and comfortable for me; it no longer seems strange to sit and wait an hour because someone is late for a meeting, or decide on the spur of the moment to pack and leave to go somewhere for a week. I like to journal and keep an over-the-top daily outline on paper of what I do each day, no rich details, just events, because details that may be interesting to the next person have just become a part of my everyday life. So, “What does a normal day look like for me?” I pondered again one Sunday evening. How could I answer this question so constantly asked me? Maybe I could keep a more detailed journal for a week and send that as an update. This idea seemed good to me and I decided that once I was back home and more settled into “normal” life I would do just that. “Normal,” I thought to myself again, “What if something else comes up and then it won’t work?” Realizing that if I wait for something “normal” to happen I would never do it because “normal” was more abnormal than the normal abnormalness, I began to write a more detailed journal entry of that very day’s events for those of you who would be interested in hearing what a normal day looks like for me. Here is a week of my “normal” life- ENJOY! I love to sleep late on Sunday mornings. This Sunday I happened to be in Puerto Cabezas at Verbo Ministries (It is always a treat to be in Port on a Sunday to attend church services). I had come to Port for several different reasons; the first being that I needed to have some legal documents signed for the ministry, and the second being that there are some children here in the children’s home that are very close to my heart. I had also been asked to run a few errands for some friends in the meantime. I had done most of my errands the day before but had a few left to finish. I had arrived Saturday and had originally planned to stay a week but, because of political unrest, I was advised to head back as soon as possible. I woke up at 5:30 with no sleep left in me. After a shower (showers here are always cold) I got my Bible, journal, and coffee in a rose cup (I am not a coffee drinker but this morning it seemed like a good idea) and sat on the porch to enjoy a few hours, just God and me. At 8:00 I had a meeting scheduled at the park with the son of a friend who had sent him some money to buy her a phone. I had given him the money the day before and he hadn’t been able to find the phone his mother wanted. So, at 8:00 I left my quiet morning behind and caught a taxi to the central park where I waited for twenty minutes till Abelardo showed up. He had asked me to show him where he could find the phone his mother wanted so he could buy it and give it to me to take back with me for his mother (It would have been much simpler if I had kept the money and bought the phone myself). He was in no hurry and by the time he got his dealings done it was a few minutes close to time for church. As soon as I could get away I flagged down a taxi and headed back to Verbo. I quickly slipped on a skirt, grabbed my Bible and got to church only five minutes late. When church let out I found one of my special little boys and bought him a snow cone from the vendor outside. I bought two more and headed over to the children’s home to find one of my special little girls (who isn’t so little anymore) and share a heart-to-heart talk and a snow cone. After a yummy lunch with Pastor Earl and Damaris I set my mind to the document I still needed signed. After trying for an hour to get ahold of Steve, whose signature I needed, with no avail, I went back to the children’s home to find one of my little men. I had talked to the director of the children’s home and found that my little man wasn’t doing so well. I talked to him for a long time and wiped his tears and fought back my own as I encouraged him to do better in school and behave well. After assuring him that I loved him and believed he would try and do better, I walked to a friend’s house whom I believed could help me get ahold of Steve to sign the document. My friend was busy recording music with another friend but quit his work and had that friend take him on his motor-bike to Steve’s house. After showing his friend where Steve lived he came back and had his friend take me and drop me off there (confusing isn’t it?). When I got to Steve’s house he wasn’t there and his wife had no idea when he would be back, so I talked with her and asked her to please have Steve come by Verbo to sign his name. The guy with the motor-bike had already left and I had never been in this neighborhood before. I had no idea how to get back to Verbo (the guy who had brought me hadn’t followed any path but just weaved in and out between houses to get there) and there were no taxis in this neighborhood, I had to walk out. This made me a little nervous because I wasn’t sure of the path, plus it is really quite dangerous for a loan white girl to be walking in a secluded neighborhood. I followed the path Steve’s wife had pointed out to me and eventually came out to the main road where I could find my way back to Verbo. My alarm didn’t go off at 4:10 like it was supposed to. I flew out of bed at 4:49, got dressed and out the door in five minutes. A friend was waiting with his motor-bike to take me to the bus station. I wasn’t the only one late though; the bus itself was late and pulled into the station just as I did. Approximately 40 people already waited impatiently and as soon as the bus came to a stop, a mini stampede occurred. I stood back and watched for a while as everyone tried at once to squeeze through one narrow door. After things calmed down a bit I too stepped onto the already crowded old school bus. Today it was said, only one bus would be making the trip as the other had broken down. I debated climbing up on top with the cargo but decided first to see what the inside held. The aisle was full of people standing and seats occupied, only a few seats remained with backpacks placed on them showing they were reserved. The bus driver (I had been acquainted with him from previous travels) sat quietly on his seat watching as people stuffed their backpacks and bags in the overhead bin and fussed that there wasn’t more room. I greeted the driver and he replied with a friendly “good morning,” then called to a lady sitting only three seats back and asked her to remove the backpack that was beside her and motioned for me to take the seat. An hour passed and the bus filled till it seemed it would pop at the seams. We were packed like sardines on the inside and the top was also loaded with lots of cargo and about twenty-five people. Thankfully Chele is a careful driver and we made the trip from Puerto Cabezas to Waspam safely in five hours. Upon arrival I jumped off the bus and dashed through the rain to a taxi whose driver was a friend. After he had dropped the other four passengers off, he brought me to our rented house where I left my backpack and then walked up the street to buy minutes for my phone and a few groceries for lunch. I cooked and ate a simple lunch then walked fifteen minutes to the internet café where I had a short meeting with one of the ministry board members. Afterward I slipped away to missionary friends Tom and Nutie’s house to say good-bye before they leave for vacation tomorrow. Tom generously gave me a ride back to my house where I quickly busied myself, withdrawing money at the store next door, paying the house rent, and getting the money I had withdrawn changed from dollars to cordobas because the store I had withdrawn it at only had dollars. I got back to the house and had a random lady ask me to help her with her English homework. I spent fifteen minutes trying to help a total stranger, who knew no English whatsoever, with her English homework (because when you speak Miskito, you are Miskito, and Miskito people always help each other out when they are in trouble). I then talked with a boat guy and “secured” a seat on a boat that would be going upriver in the morning. This morning my alarm did go off at 4:15 like it was supposed to and I prepared for the day’s journey with final packing, heating leftover rice and beans, frying an egg, carrying water to flush the toilet, and making sure the house was presentable for the next person coming through. At 5:00 I took my bag down to the long dugout boat, then climbed the ninety-six steps back up to the house to bring my backpack. The boat driver was rather slow getting around and we didn’t leave Waspam till 7:00. We had a 40HP motor on the back of the long boat and with about a dozen people and a bunch of cargo we were loaded decently but not excessively. I chose a nice spot to sit on the four-inch board nailed along the edge of the boat. I got to ride next to the boat driver’s sister. She is a sweet lady and I enjoyed visiting with her and playing with her four-year-old son. At 12:00 we had our first rest stop in a little village in Honduras. Only two more hours in the sun (praise God we had no rain) and I was home with my family. But how empty the house felt. My parents and Lizzie and Mary are all in the States at the moment. Chris had gone upriver to visit a pastor and wouldn’t be back till the next morning, and John was out working in the jungle. After sharing a few stories with Camille, Katie, and Eva, I delivered medicine (that someone had sent from Port for their mother) up to the neighbor’s house. A large group was gathered on the porch just chatting about life, politics, crops, and the weather. After visiting with them a while I gave Daviana her meds and returned to my house where I just hung out the rest of the day playing with the neighbor girl’s sweet baby and visiting with those who stopped by the house. Rice and beans were heated for a simple dinner and after we had filled our stomachs, we had a family share time and prayer before we turned in for the night. In our house we have lots of adult women all involved in ministry; and along with ministry comes lots of house work. To allow each of us to be involved in the ministry that God has called us to, yet carry our share of house work, we divided it out in days. Wednesday is my day to be responsible for the house and the kids. I got up at 4:30 to spend a little time with the Lord before the busyness of the day began. At five I found my way to the kitchen where I made a breakfast of fried beans, eggs, fried bread, and coffee, for the family and for the two guys John had hired to help him plant corn and plantains. Over breakfast I quickly cooked rice, boiled green wild plantains, and made spaghetti soup for John to take out with him to the jungle for him and the guys for lunch. After breakfast we read 2nd Peter chapter 3 for family devotions both in English and Miskito as the neighbor girl had joined us for breakfast and devotions. After devotions the house quickly cleared as everyone went about their own business, John to the jungle, Camille to teach school, Eva to do laundry, and Katie to clean the storage room. I busied myself with washing dishes, heating leftovers (we have no refrigeration so this is the way we keep food from spoiling), loaning a friend our scales because they butchered a cow and were selling the meat, buying milk from one of the village boys, sweeping, mopping, and getting our kids (a group of fatherless children that we take care of most days) off to school. After I had the house all cleaned and the kids sent off to school, I began cutting up and grinding the three pounds of beef that I had bought. A gang of six little boys (ages 6-8) from our neighborhood decided to drop in and hang out for an hour. A reckless bunch they are, but, if in the right mood, they can be quite sweet and fun. It is amazing what speaking positively and expecting children to be good can do to even the most misbehaved ones. “Yes, you can look at the book because you are going to be very careful not to tear it.” They were so careful! An hour passed with Bible story books, playing fishy, and constant questions before, all of a sudden, they were gone as quickly as they had come. It was now time to start lunch; we had fresh meat so we would have a treat. Rice, beans, plantain chips, and cubed beef chunks in tomato barbeque sauce. As I chopped, fried, and stirred I had another little fellow, with his slingshot strapped on his head, join me in the kitchen following me everywhere I turned. He had caught a dragon fly and brought it to show me. The little fellow was a nine-year-old boy disowned by both father and mother, left to be raised by his grandmother who scarcely cares for him. He often talks of suicide and death, saying life is too painful to live. As he followed me around telling me of his bird hunting expeditions and the bugs he found, it was easy to hear his cry for love hoping someone would care. I listened to his stories and tried to speak encouragement and love into his life while in my heart whispering a prayer for this poor child. Chris had come back from Kitaski at 10:00 and joined our little group for lunch. I had cooked enough food for all our kids, expecting them to come for lunch but they didn’t show up till later in the afternoon (this is common, but if we don’t cook enough and they show up five minutes beforehand, it is much worse than having leftovers to deal with). After I had washed the lunch dishes I set myself to cleaning the crammed little office space that seemed impossible to keep organized. All of a sudden at 4:00, I realized that I had forgotten to make bread dough, and if I wanted to make our special supper of burgers and macaroni salad I would have to bustle. I mixed the bread dough and put the macaroni, eggs, and potatoes on to boil. Chris was working on the non-functioning signal booster attached to the rafters. When disturbed, the rafters, eaten by bugs, cause a layer of wood dust to cover everything in the house, people and things alike. I served our guests ripened bananas, and at their request took photos of their new baby. I chopped onions and then realized I needed to pick more peppers, so I ran down the stairs, breaking half of the rotten bottom step off as I went (with so much rain, moisture, and so many bugs, things just seem to wear out really fast). Right after dark, after everyone else had gone home, we enjoyed our luxurious dinner of burgers, macaroni salad, and imitation iced tea- which was room temperature (approx. 90 degrees). The boys played guitar and we sang as I washed the dishes and the other girls took turns in the shower. Us girls then sat down and redid the house-keeping schedule for the time while Mom is in the States. We seemed to have started a tradition of reading missionary biographies every year while my parents are in the States, so Camille pulled out a book “Making Jesus Lord” and read aloud to us as we sprawled out on the floor and the bench. After a chapter, we decided it was late (9:00) and we better leave the rest for another night. We had a short share time of how our day went, what we saw God doing, and shared prayer requests. We then prayed together and each found our beds. At 4:45 this morning when I woke up, the first light of dawn gave a beautiful glow to the wet world outside. As I stood on the top of the steps and brushed my teeth I could hear the distant roar of yauhuk (a water fall miles away on the Waspuk river) and knew that the little river must be flooded. After a refreshing cold shower, I walked out through the drizzling rain to unlock the gates that kept out vandals during the night. Personal devotions, breakfast, family devotions, and my day was well under way. After spending half an hour standing out under a tree trying to catch just enough signal to send a small message to my parents, I decided it was time to put my attention to my little 5×8 office space that needed some organizing. I picked up my computer to put it away in its place but decided it was more important to finish some work I had left undone. So, I set my computer back on the messy desk and worked till lunch to finish my project. After a yummy lunch of squash and tomato soup with rice, (squash and tomatoes given by one of our neighbors as a gift) I put my computer away and began the tedious job of organizing the small office space. I finished the job by 4:00 with a great feeling of accomplishment. The evening before we had decided to pick one specific person each day to pray for. Camille was the person of the day, so, having finished my work I grabbed my journal and looked for a quiet place in the children’s home to spend some time in prayer. About an hour later I came back to the house where Marcos had just come back from visiting one of the small local churches in Klisnak. We all leaned in with anticipation trying to hear the events of Marcos’ day over the pounding rain on the tin roof that kept us dry. Eva heated some beans and set bread down for dinner, then popped some popcorn for us to snack on the rest of the evening. Another hour of story-time, a time of sharing of what each of us had seen God do during the day’s events, prayer, good-night hugs, and then we all snuggled in under our blankets with the rain still coming down. 4:30 seemed to roll around way too quickly and another day began with personal devotions, breakfast at 6:00, and family devotions. The two large tubs of laundry that had hung on the porch all day the day before needed to be rehung again this morning. I scanned the gray sky looking for any little glimpse of sunshine but found none; instead it looked quite promising for rain. “Forget about rain,” I thought to myself, grabbing a bed sheet and hanging it on the line, “We need dry laundry.” I knew full well that I would probably have to take down and rehang all the laundry under cover about the time I had it all hung. Washing laundry on a washboard or on a rock in the river can actually be quite enjoyable, but taking it in and hanging it back up 4-6 times a day, or hanging it for three to four days in a row because of rain is sometimes a trying job for me. Dry season (February-April) is my favorite time of year, this being one of the many reasons; but this isn’t dry season so the battle of drying laundry is just a part of everyday life. Thankfully today even though the sun never showed its face once, the majority of the laundry was dry enough (if used within the week) to fold and put away by the time the rain started at lunch. The rest of the laundry I hung under the porch for the remainder of the day, then we would try again tomorrow. Besides hanging and taking in laundry, I spent the rest of my day working on accounting for the ministry. This is a big job, but one the government requires and someone has to do. It seems every time we think we have figured out everything the government requires, we find out more restrictions and requirements. I think ministry would be so much more fun if there were no such thing as legal paperwork, but this too, has to be done if we want to minister here, so I spent all day in the office doing just that. Outside my office window is a tall rose-apple (pera) tree full of bright red ripe rose-apples. I enjoyed watching all day as the village children came and asked for permission, then picked and enjoyed its juicy ripe fruit. My heart felt so full! So much has been accomplished in the five and a half years we’ve been here. There is such a thing as RIPE fruit, and the kids all love it. Permission is asked rather than constant stealing, and though it would seem easier at times to just let the children have free range to the trees, it has been a huge opportunity to teach respect (for both rules and fruit trees). As harsh and cruel as it seems to the children when we don’t permit picking the fruit when it is still tiny and green, there is so much joy in their eyes when they get to bite into a juicy ripe fruit instead. On one occasion I had stepped out of the office into the main room to get some fresh air when I was given an opportunity to get lots of it! The neighbor’s pig had somehow found its way inside the fence and was out under the rose-apple tree digging up our yard. Eva and I decided if we chased it, it would slip out a hole, then we could close the hole up. The silly pig wouldn’t be chased but just stood there unafraid, until we started throwing sticks at it (we never actually hit it, but they all know what sticks are). The thing must have forgotten how it had come in because it just ran in circles when we chased it. By the time we gave up on the pig finding its own way out, it had gained a healthy fear of us and we couldn’t just catch it. We chased it till we had it cornered, then Eva jumped on top of it as it tried to make its escape. Eva took the back legs and I the front and we pitched him out the gate (no harm was done to the pig). After a dinner of rice and beans, fried squash, and tortillas, prepared by Camille, we decided instead of story-time tonight we would watch a new movie that Mary had brought six months earlier. We all enjoyed the inspiring true story of “MULLY,” then talked late into the night (10:00). My mom usually takes Saturday forenoons in the house, but with her being in the States I had agreed to take the job. Camille made breakfast but then left to go do her laundry and the house was mine. I had just finished washing dishes, putting the house in order, and sweeping under the house (our house is built on stilts), when Marcos came back from Kitaski (this is a village about an hour upriver from KrinKrin by boat) where he had been in an all-day meeting the day before. We quickly gathered around to hear how God had intervened against the strong opposition that had been building and had come to a head against the work there. How exciting it was to hear all that God had done in this important meeting- favor from government leaders, church leaders, and the people of Kitaski, while those trying so hard to bring the work of God to a halt there were not able to. We could finally move forward freely with the work that God had called us to do in Kitaski. 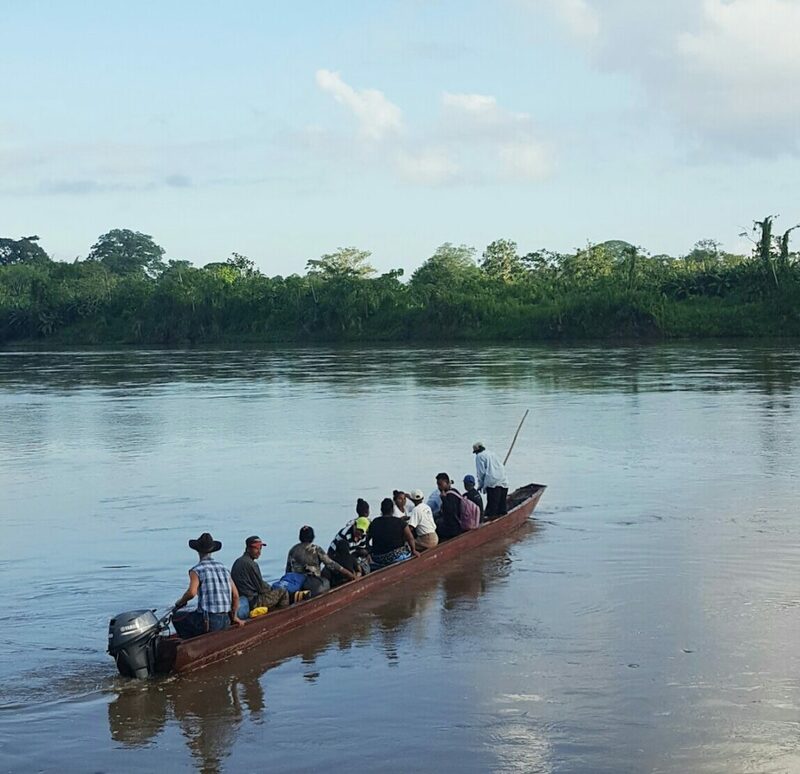 At 5:00 I woke up with the sound of Chris and Marcos moving around preparing to go visit Klisank (a village a little way down the Coco river and up a smaller river) where they had a meeting scheduled to deal with some church conflicts there. I got up and closed the wooded shutters in our bedroom, trying to block all the light I could, then climbed back into bed and slept till 8:00. After a long shower, I unlocked the gates and fixed myself a cup of coffee (coffee must be a Sunday thing). Katie carried her computer and a CD (from Camille’s home church) out to the children’s home where we gathered to listen to a message from her pastor on “The Pleasure of God’s Presence.” After the message we shared experiences and exhortations with one another before dispersing. After a yummy lunch of chili and cornbread with five from our family, ten village children, and a neighbor couple, we all just hung around for a while talking with those who stopped by to visit. After several hours I left Katie with a house full of children and neighbors, and found Camille to share a heart-to-heart talk. I feel so grateful to be able to have family and friends who love me and listen to my dreams and disappointments, also sharing bits of wisdom and encouragement. A large village meeting took place this afternoon about the possibility of changing the leaders, and I decided to sit in and see what would come out of the ordeal. A lot of arguing and yelling took place and nothing was accomplished, as usual. Chris’ meeting in Klisnak had gone well, and he came home just as the village meeting ended, so I went up to the river bank to meet him. He had brought a young couple with him who would be spending the night at our house then walking back to their village in the morning. I quickly cooked a meal of beans and rice and served it with cheese that we had bought the day before from some Spanish farmers. Story-time was different tonight as the young man talked for hours about his childhood experiences living deep in the jungles sometimes alone for a month at a time while his father left to see after business. He spoke of encounters with tigers, thieves, wild hogs, murders on the run, and hunters who found him lost deep in the woods after dark. He spoke of carrying a hundred-pound bag through the mud at the age of ten, and being beaten by his step-father when he stumbled and fell under the weight. What hardness these experiences had created in this young man; he spoke of them with such a lightness as though they were fond childhood memories. To him they were just normal life. Our eyelids finally became heavy and our storyteller realized it was time for bed. We spread out two foam mats in the main room for the couple to sleep on, and we each found our own beds after a short time of prayer. And so goes another “normal” week in my life living along a river in the rainforest of Nicaragua with an indigenous people group called the “Miskito People.” I hope this has been helpful in answering the questions of what a normal day looks like for me. I hope you have enjoyed!